Previously, scientists thought that Europa's frozen ocean, albeit massive, was not conducive to life. With this new evidence of liquid lakes that mix with the frozen ocean, however, eventually discovering life on Europa seems more likely. Researchers used data from NASA's Galileo spacecraft to detect both the previously-discovered underground ocean and the new shallow lakes. To find the lakes, scientists looked at a couple of Europa's ubiquitous "chaos terrains." These chaos regions give Europa the complexion of an adolescent boy. Initial observations of Europa's surface as seen from Voyager indicated various areas of mottled terrain and smaller isolated spots known as lenticulae—latin for freckle. For this research, the team created a model to explain why Europa's so splotchy. 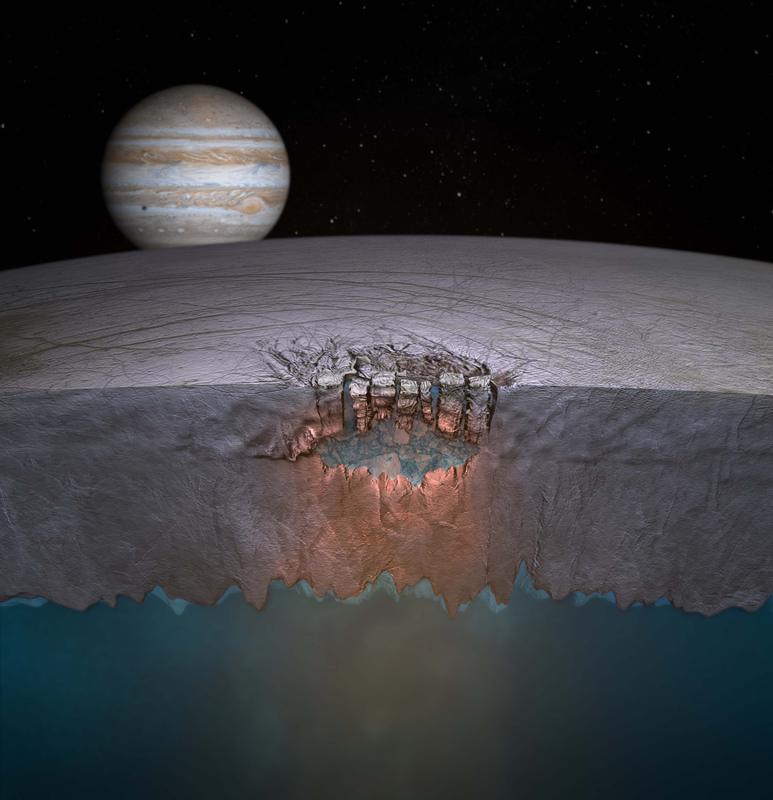 When the team created their model, they first looked to Earth for inspiration: "This new understanding of processes on Europa would not have been possible without the foundation of the last 20 years of observations over Earth's ice sheets and floating ice shelves," said coauthor Don Blankenship from the University of Texas at Austin in a statement. In fact, the researchers' model predicts that the interaction between the frozen ocean and the liquid lakes above may have formed the chaos features. If the model is correct, this interaction could provide an avenue for transporting nutrients and energy between the surface and the frozen ocean, increasing the potential for life. A video showing how shallow lakes help form the bumpy terrain on the surface of Europa. Video courtesy Britney Schmidt/Dead Pixel VFX/Univ. of Texas at Austin. The team's model has strong support because it has helped resolve some of the debate surrounding the characteristics of Europa's surface. Scientists have previously argued about Europa's surface-level ice shell, but this research's added complexity explains seemingly conflicting evidence. For more information on Europa's oceans and lakes, take a look at this press release from NASA. For more images from the research team, click here. I can't believe that we're not making exploration of Europa a top space priority. Everywhere on Earth where there's water there's also life.